To keep the main JScript Panel thread for component updates/issues only, I've started this. Although many scripts should work in WSH Panel Mod and JScript Panel, there are incompatibilities which are only going to increase as time goes forward. New JScript sample lastfm bio.txt used in chooser panel crashes. The other text samples I used (properties & thumbs) work fine. Error message below. Well it works for me so try putting the bio script in a fresh panel and see if you get the same error. If you do, try browsing wsh_data\artists\WHOEVER IT WAS and deleting the bio.www.last.fm.json file. is there a way to show a jpg in a top level folder that does not have media in it? the ..\ tells it to look in the parent folder. also, what image gets displayed depends on the order it appears in the list. if you put it before the pattern that gets the art from the same folder as the music then it will always override when it exists. if it goes after then it won't be displayed when there is art present in the same folder. No. foobar works its way from top to the bottom of the list and stops whenever an image is found. Removing the json file doesn't help entirely. It will repeatedly crash on one artist in particular every time. (hed)PE, if selected from any library browser or filter, causes it to fold instantly. Naming issue perhaps? WSH version works flawlessly yet. That artist works fine for me with JScript panel so it's not that. I think your best bet is to stick with WSH panel mod. Already switched back. Error spam below. If you're going to report errors, don't use the panel receiver script because it's impossible to tell what file/line it's referring to. Sorry about that. In this case it triggers on LastFM Bio. Yeah, you mentioned that in your original post. How else do you think I tested it? Seeing as my previous post was too cryptic, let's just forget it. You use WSH panel mod and don't ever bother me again. 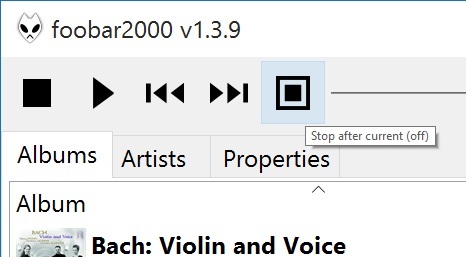 Dragging & dropping folders with mp3 over JScript Paned doesn't work in Windows 10. Is it a limitation of the component? Drag/dropping files on to the panel works fine. You cannot drag files out though - that is a limitation of the component. That script has been broken the last few days as I forgot to update paths in it when I renamed a folder. It is working now though. I am using HiDPI settings on Windows 10 (200%), and with the new JScript Panel the tooltips are appearing very small. With WSH Panel Mod the tooltips used to be properly scaled. Search your script for window.CreateTooltip and then add your font name/size/style. The LastFM bio panel crashes if the download fails for any reason. When the json file is zero bytes in size this.content is null at https://github.com/19379/js-marc2003/blob/m...js/text.js#L250 and you can't access length element of null object. You can fix crashing by adding "|| !this.content" before you check the length. It might also make sense to report to console potential issues with the bio download. Thank you for your reply. I use window.CreateTooltip("Segoe UI", 24, 0) now in order to double the font size, which is working fine. BTW, I didn't use on_tooltip_custom_paint anywhere in my scripts. But passing the font parameters explicitly resolves my issue anyway. I've ported YouTube Track Manager to work with JScript Panel. Interactive discography with similar & related artists, for choosing tracks & albums. Support for last.fm top albums, top tracks, top similar songs & MusicBrainz releases, including singles & remixes as well as albums & compilations. 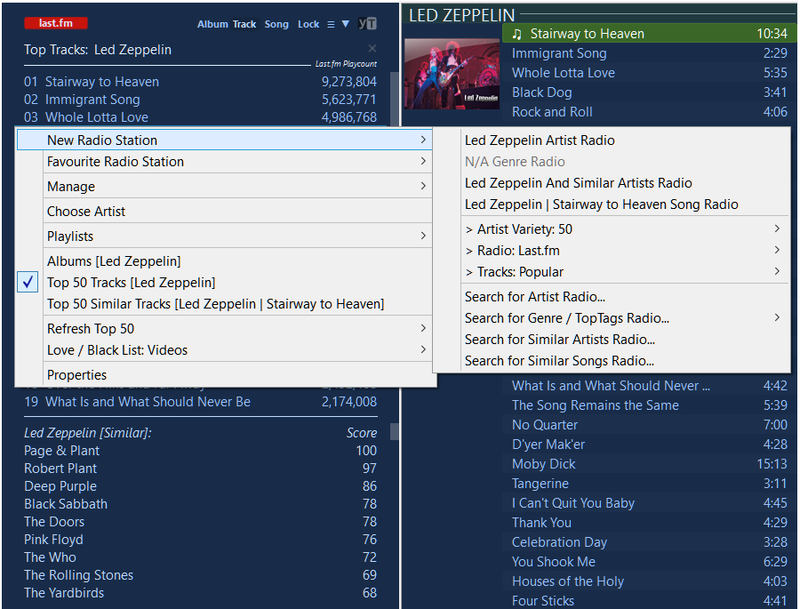 Builds albums & optionally automatically creates m-TAGS files using track lists from MusicBrainz & last.fm. Offers auto-generation of top 50 artist tracks & top 50 similar songs. Offers auto-pick radio modes for artist, genre / top tags, similar artists & similar songs playback, based on track popularity data from last.fm, echonest or your library. Radio modes are great for listening to music of a chosen style. Last.fm & echonest also work well for music discovery. Library radio offers a new way of playing your own music. Tracks can be YouTube links, exclusively media library tracks or a mixture of both where media library tracks are preferred, according to settings. YouTube links are advert-free & can be audio only up to 256 kbps AAC or video. Improved nowplaying panel that can act as a cover & artist artwork viewer if no longer wish to look at album & track lists. Options > right click menu + properties (*USER...). Double click > album manager: loads albums/tracks. Double click > nowplaying: toggles image/text types. Middle click > nowplaying: toggles image only mode vs image + text. yT button > toggles nowplaying vs album manager panels. For further details, see earlier posts here or here. Download the latest release (YouTube Track Manager v2.2) here.